Leading TV facility dock10 has announced the opening of its new studio HQ8. 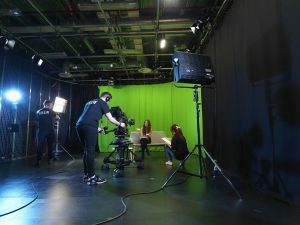 The 750 sq ft television studio is suitable for small sets and has green screen capabilities. It comes fully lit and with complete integration into dock10's gallery and post production infrastructure. Designed to help customers who want professional studio hire by the day, HQ8 will also enable producers in dock10's main studios to simultaneously employ a smaller second studio for additional commentary, a behind-the-scenes view or a companion show. “Digital platforms like YouTube have fuelled an explosion of video content,” said Andy Waters, head of studios at dock10. MediaCityUK-based dock10, which acquired 422 late last year, recently revealed a new set of editing, visual effects and graphic suites.